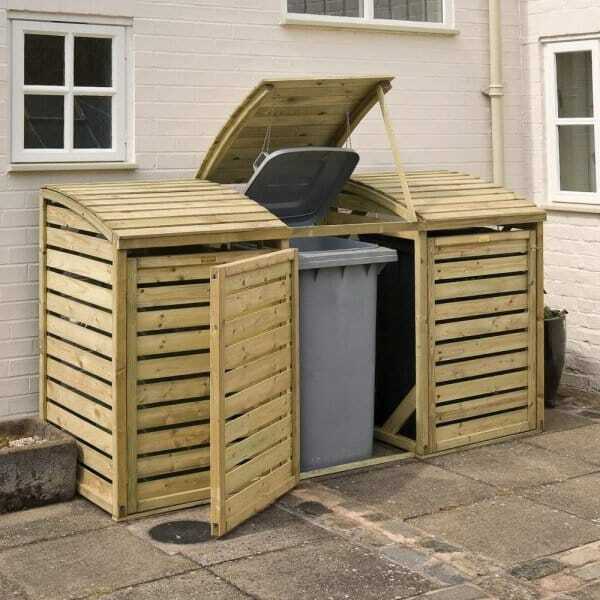 Triple Bin Store: This Triple Bin Store is suitable for 3 standard size wheelie bins and comes complete with independently opening lids. Each lid has a set of chains to attach to your bin so they lift up for easy use and access. This store has been designed to be a practical gardening storage solution whilst maintaining an elegant stylish look. Each door comes complete with a latch which will stop pests getting into the bin area. Hide those wheelie bins and if you desire, this bin store can be painted or stained. The bin store has been pressure treated against rot and will require some assembly. Review - This does exactly what you expect and hies 3 ugly wheelybins out of sight. It is a little tricky to assemble and I felt that the metal bolts that keep the doors closed were cheap and detract from what is a decent product. Overall am happy with my purchase but I have in the back of my mind to buy soime decent bolts and replace these fixings when I get around to it,. This does exactly what you expect and hies 3 ugly wheelybins out of sight. It is a little tricky to assemble and I felt that the metal bolts that keep the doors closed were cheap and detract from what is a decent product. Overall am happy with my purchase but I have in the back of my mind to buy soime decent bolts and replace these fixings when I get around to it,.